Early War museums have a reputation of being formal and static stately edifices. The displays of arms are synonymous with this stature approach. The importance of interaction and engagement between the public has developed this notion to be a more interactive experience. 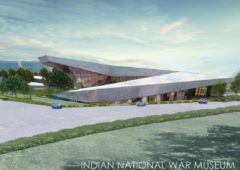 Our design concept for the Indian National War Museum is a contemporary interpretation of the Chakravyuha spinning wheel maze formation to capture the enemy. In gaming terminology, it is synonymous to the creation of levels of force and strength. The entire musicological design is a visual and literary journey that cuts through sections of time and elevation which takes each visitor through the experiences of traditional warfare from elephants to the modern warfare of tanks, super jets and drones. 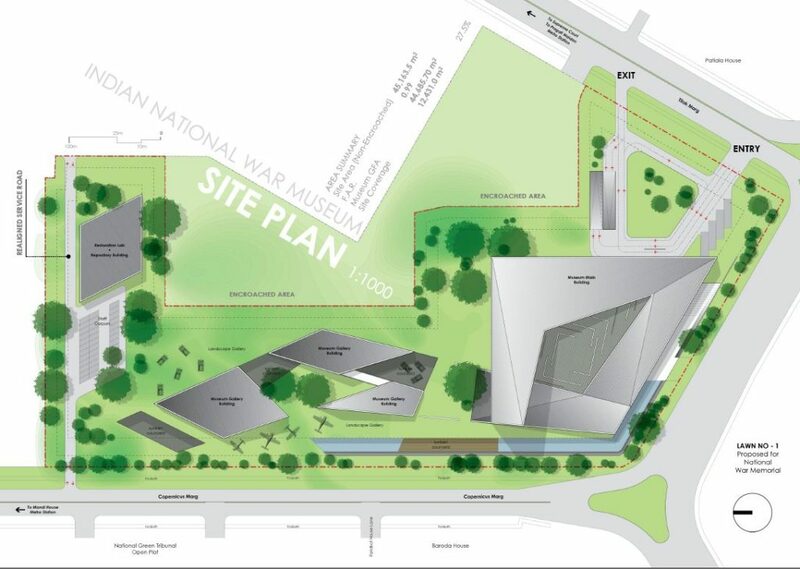 The spatial experience takes each visitor from the ground level to the underground bunker exhibition spaces as they meander through the water moat of the naval exhibits. This copacetic design approach enables each visitor to transcend each exhibition space seamlessly, thus rendering it user friendly. Lutyens axis and India Gate has a strong influence to the response of the planning for the entrance grounds and National War Museum building. The main entrance into the museum from Tilak Marg where the building is set back into the heart of the site. The building pays homage to India Gate with a prominent frontal addressing this aspect. The team made a conscience effort to homogenise the modernity of the design whilst respecting the existing vernacular architecture surrounding the site by sourcing the availability of local stone as the primary material to clad the building. 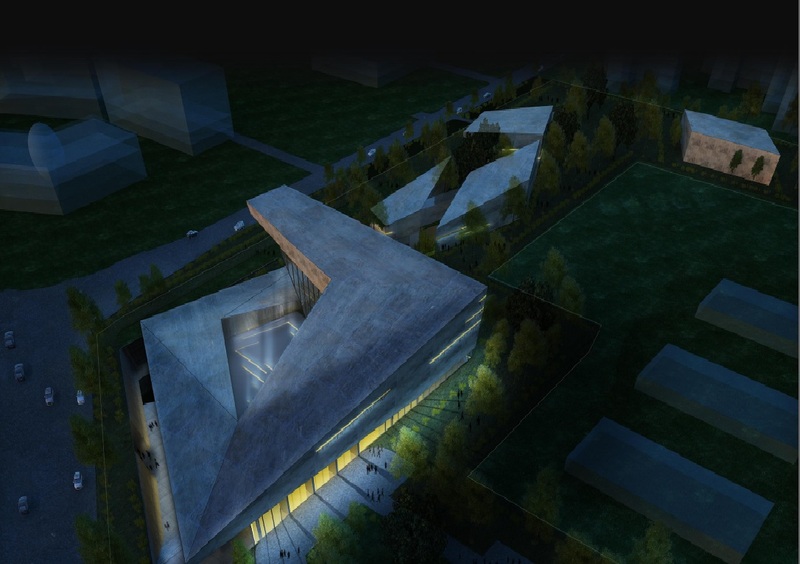 The long axis of Copernicus Marg creates a natural spine for the main underground exhibition spaces of the Museum only appearing as shards vaults in the landscape. The approach to the site for the new building is to touch the earth lightly responding to a more sustainable place making. The plinth of the entire museum only covers 27.5% of the 45,163.5 square meter site keeping the Main entrance quadrangle to where it needs to be. 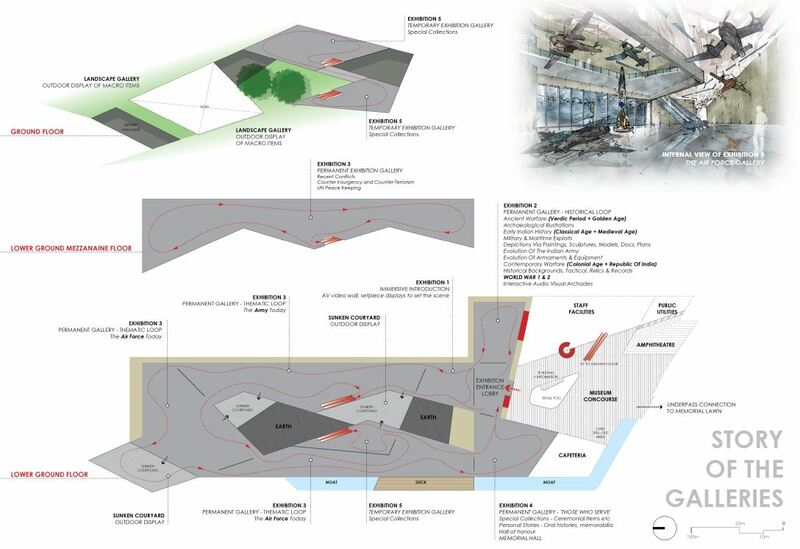 Preservation of 130 (40%) of the largest and older trees allowed us to create major exhibition spaces underground to reduce the impact to the site whilst capturing Lutyens garden masterplan concept for Princess Park. Some 130 out of 346 trees in the non-encroached area remain in its original location with a view to relocate more of the precious trees to perimeter locations so that the trees are salvaged within the grounds for the museum. A moat surrounds the main frontages descending down 8 meters facing India gate and Copernicus marg. Sunken courtyards and raised tree plinths creates dramatic insertions to the grounds. The ground memorial link connects under and up to the proposed memorial park and India Gate.